Three-year-old filly Syrahbeel continued her winning ways at Pakenham on Thursday making it three from four this preparation. The Savabeel filly, whose only blemish this campaign has been a third placing behind city class Majestic Lass, was totally dominant in the 1400m BM64 event thanks to a terrific ride from Craig Newitt. The in-form hoop settled the race favorite in the one-out one-back position before easing to the outside as the field entered the straight and powering away for an easy win. Trainer Danny O'Brien was thrilled with the result. "This filly has really taken the next step this preparation as she has progressed from a maiden to a Class 1 to today's BM64 in quick succession and given the strength of this win there is no reason why she can't continue climbing the ranks," O'Brien said. The victorious trainer also heaped praise on Craig Newitt. "He is in super form at present and that was a 10 out of 10 ride." Newitt said he felt he had the race in his keeping from early in the race. "Once we lobbed into the one-one, she was never going to get beaten, she really has taken great benefit from the confidence of her recent performances and I expect her to keep winning races," Newitt said. 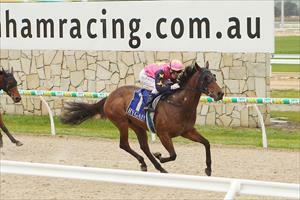 Syrahbeel has notched three wins and three placings from 10 career starts and $42,850 in stake earnings.